Twenty-two years after his death, Richard Nixon still fascinates. His public career spanned nearly five decades, from his role as a young congressman in exposing Alger Hiss as a communist spy in the late 1940s, to his years as Vice President of the United States in the 1950s, to his unsuccessful runs for President in 1960 and California Governor in 1962, to his immensely consequential presidency and resignation due to Watergate, to his post-presidential role as elder statesman. Echoing Dole, Douglas Schoen, a longtime Democratic Party pollster and Fox News contributor, writes in his new book, The Nixon Effect, that the 37th President was “the most important American politician of the postwar era.” Schoen’s focus in this well-organized, splendidly written, and compelling book is Nixon’s impact on the ideological and political evolutions of both the Republican and Democratic Parties, especially the impact of his presidential campaigns and his domestic and foreign policies as president. 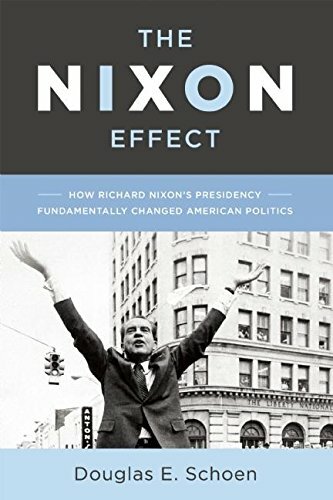 Schoen contends that Nixon's campaigns in 1968 and 1972, his centrist-to-liberal domestic policies, and his visionary foreign policy realism produced ideological and political reactions in both parties that shaped the political landscape for the next four decades, and continue to influence our politics today. Schoen knows his political history but exaggerates the extent of Nixon’s influence. The 1968 Nixon campaign pursued a “Southern Strategy” that focused on restoring law and order, appealed to states’ rights, and pledged an honorable end to the Vietnam War in an effort to shift the political allegiance of Southern white voters from Democrat to Republican. But that allegiance was already shifting as evidenced by Barry Goldwater’s success in the Deep South in the 1964 presidential election. Nixon did not cause this shift; he recognized it and skillfully played to it in his campaign. Southern whites were part of the larger “silent majority” that frowned upon race riots, campus unrest, the sexual revolution, and anti-war protests. Similarly, Nixon’s centrist-liberal domestic policies and foreign policy realism on Vietnam, China, and the Soviet Union, did not push the national Democratic Party to the ideological left. As Schoen acknowledges, the McGovernite capture of the Democratic Party was a reaction to President Johnson’s dismal and inept waging of the war in Southeast Asia and cultural shifts in our society. Challenges by Eugene McCarthy and Robert Kennedy to Johnson’s re-nomination in 1968 were a manifestation of this leftward movement of the Democratic political elite. Nixon, again, skillfully capitalized on this political phenomenon by winning the 1972 election in an historic landslide, but he did not cause it. American conservatives, especially religious conservatives, however, were also galvanized into action by cultural changes and Supreme Court decisions that expanded the rights of accused criminals, outlawed public school prayer, and legalized abortion nationwide. Nixon benefitted from this but he did not cause it. Schoen clearly admires Nixon’s political skills and sees parallels between Nixon and Bill Clinton. Both presidents, he writes, “possessed unrivaled instincts for locating the American political center.” Both men moderated their party’s “worst tendencies, while co-opting the best ideas of the other side.” Both were skillful political “triangulators,” governing the nation as centrists. Finally, both, in their own way, were determined survivors of scandal, political and personal. Presidents George W. Bush and Obama, according to Schoen, failed “to learn from Nixon’s lessons” in building domestic coalitions and conducting foreign policy. Politically, Schoen argues, both Bush and Obama “polarized to maximize their base turnout,” but, unlike Nixon, did not expand their governing coalitions. In foreign policy, both presidents failed because, unlike Nixon, they did not understand the uses and limits of American power. Surprisingly, Schoen agrees with Nixon partisans that Watergate was a third-rate burglary that Nixon’s political and media enemies transformed into a major scandal, but recognizes its lasting impact on American politics. Watergate moved the Democratic Party further to the left, and established the precedent for partisan investigations of the Iran-Contra and Whitewater-Lewinsky scandals. Watergate, Schoen rightly argues, “created a new politics of scandal” and further undermined public trust in government, but the “ideological polarization of the parties” that Schoen attributes to Watergate preceded it by a decade.